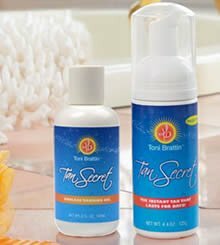 Comprehensive review of Tan Secret foam. See what real experts and actual users have to say about this self tanning product. Tan Secret uses a “different” approach to self tanning than just about any other product out there. Instead of using DHA to work with skins’ amino acids; Tan Secret just stains your skin a bronze color. It’s a novel idea; but unfortunately it fell a little flat for us. Overall the color it produced was pretty good. And application was quick and easy. The problem we had with Tan Secret is the color just didn’t last very long. That means you’ll need to use this 3 times a week if you want to maintain your tan; and that’s just way too much for us (especially when there are self tanners out there that last 5-7 days). So overall, there are definitely some things we like about Tan Secret, but unfortunately the things we don’t outweigh the things we do. Tan Secret pumps out of the bottle a very dark, scary-looking , black foam. It feels like most mousses on the market. This is where Tan Secret is quite a bit different than most other “self tanners” out there. With this product, you put it on in the shower while you’re still slightly wet. Then you quickly wash it off to reveal tanned skin. With Tan Secret there really isn’t a drying time, which is nice. You put it and pretty much immediately wash it off. This is one of the few products that doesn’t require 6-8 hours for the color to fully develop. Tan Secret really doesn’t have too much smell. Honestly, it just smelled like plastic and chemicals to us. Because this product doesn’t use DHA, there’s no “self tanner” smell the next day (or as soon as you get out of the shower). We used Tan Secret Dark and our color wasn’t too bad. It wasn’t super dark by any means, but it wasn’t as light as we thought it would be either. This is where we had some issues with Tan Secret. It simply didn’t last very long. If we’re going to go to the trouble of applying self tanner, we want it to last at least 4-7 days. Tan secret was pretty much gone after 3 days. The fading wasn’t bad or anything, it just didn’t last as long as we’d like. The messy application will probably turn a lot of guys off. But the “ease of use” might work well for guys who don’t want to keep a “lotion” on overnight. $26.95 for 4.4 oz plus another $9.95 for shipping and handling. So overall you’re looking at about $36.90 for a 4.4 oz bottle. That works out to a very expensive $8.38 per ounce. We did see a deal somewhere for $19.95 plus $9.95 shipping. So that’s a little better but still kind of expensive (especially considering it only lasts a few days). To buy Tan Secret, click here.